Not an affiliate of Citibank but just to alert those people who might need a luggage (and a credit account or two). 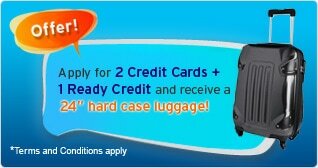 Citibank is offering a free 24" hardcase luggage if you sign up for 2 new Citibank Credit Cards & 1 Ready Credit or Savings Account now. I have seen the actual luggage at Suntec City roadshows by Citibank. It is a no-brand cabin sized lugggage but looks pretty sturdy and well made. Proabably cost you $50 or more if you purchase it elsewhere. You can have a look at it yourself and sign up on the spot at the temporary Giant Hypermart that occupies the former Carrefour premises at Level 1 of Suntec City. Just be wary of pesky promoters pestering you to sign up, don't say I never warned you. Do take note that Ready Credit is an easy credit but high interest loan facility. Use it only if you are in desperate need of cash and is confident of paying the loan & interest off with your future income stream, otherwise, you will find yourself mirred in a deep pool of debts. Even if you do not plan to use it, make sure you cancel it once the free annual fee period is over, otherwise you will end up paying for annual fee + finance charges + late interests + admin fee + even legal fees, if you forgot about it. Disclaimer : Sign up at your own risk. I am just sharing a good deal and do not stand to gain any benefit, tangible or intangible, whatsoever, from this. Nick Yeo (姚俊羽) EP "Acutally Love" <<原来爱 >> was released in Taiwan on 28th December 2012. Nick Yeo 姚俊羽 is a Singaporean Singer-Songwriter making his debut album release. He shot to fame even before his EP was released as his 2 songs was used in the OST of the popular Channel U serial "Game Plan" <<千方百计>> . If you had watched the serial, you would find the first two tracks very familiar. Below are the videos of the 5 tracks uploaded by other fans. Enjoy! As Christmas is approaching, the best way to get yourself in the Christmas-y mood - that is if where you are isn't snowing - is to listen to some nice Christmas songs. Credits to all those who uploaded the above videos to Youtube. Japanese Yen has shown signs of weakening since late Oct and has been slowly weakening against the Sing Dollar from S$1/JPY64 to JPY69. That means, for every Sing dollar, you get about JPY5 more. Across the board, everything in Japan is now 8% cheaper to the Singapore consumer than it was in Oct.
A substantial savings since the cost of living in Japan is high. If you are planning to visit Japan to take advantage of this super good exchange rate, Jetstar flies cheap flights to Kansai airport in Osaka and in pretty good timings too. You reach there early morning, so you have a full day to play in Japan. From Osaka, you can either stay on in Osaka or use it as a springboard to Kyoto. To head to Osaka from Kansai airport, you can take the train to JR Osaka (Umeda) station which is like the city centre of Osaka. Alternatively, you can buy a bus ticket from the Airport Limo bus service which drops you at selected hotels in Osaka (for eg. Hilton, Herbis or Hankyu) or other parts of Osaka. While it is slightly more expensive than trains (it cost about 1,000 vs 1,500 for the limo bus), the bus option is less hassle, more comfortable and they take care of the luggage for you. If you are planning to stay over in Osaka before heading to Kyoto, you can reach Kyoto from Osaka Umeda station by train in about 35 minutes. Otherwise, you can take the JR train from Kansai to Kyoto. You can also take the Airport Limo bus straight from Kansai Airport to Kyoto too! However if you can't stand long distance travelling on coach, I do advise you to check on the length of the journey beforehand. If heading to Kyoto, once you reach the Kyoto Train Station, there is a luggage delivery service available (fee applicable) to help you transport your luggage to your hotel in Kyoto while you take the local bus or train to the hotel minus your luggage. It is located at B1 of the train station, together with the luggage deposit service. You can then either take the local trains to your Kyoto destination or walk to the bus terminal to take the local buses. The Bus Terminal is located next to the Kyoto Train Station. Hotel Granvia runs hotels that are situated right smack in the Osaka and Kyoto main train stations. The rooms look good. If it fits your budget, it is good to stay in this hotel as the main train stations are the hubs from where you can take trains to anywhere in the city that is reachable by train. On your return flight from Kansai international airport, if you are taking Jetstar, the departure time is pretty early such that you need to check in about 8-9am. To travel from Osaka city to airport takes a lot of time and if you are not planning to wake up at 4-5am, a good tip is to plan an overnight stay at Best Western Hotel Kansai Airport (Hineno Station) on the last night of your trip. Best Western Hotel at Kansai provides a free bus shuttle service to the airport for guests and it takes about 25-30 minutes. There is an Aeon mall nearby to the hotel and the hotel also has its own communal bath which you can make use of. Here's another acoustic version of another classic from Coldplay.